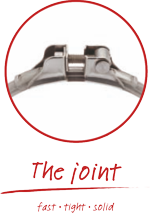 The newly developed combination joint and the extended profile allow the QUICK CONNECT® pull-ring to be placed easily over the lipped pipe ends. The clasp can be guided over the closing hook with sufficient play. The pipe ends can be connected to each other quickly - thanks to the robust and ergonomically shaped toggleclip. 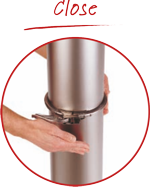 The bolt on the swivel joint can be tightened later when the ring is closed. Dismantling is just as easy as assembly. The pipe components can be changed in the blink of an eye. An unbeatable combination with the newly designed “U” shaped seal.. These “U” shaped seals were designed in parallel with the development of the new generation of pull-rings and their dual-fit was perfected. The cross section of the new QUICK CONNECT® pull-ring is tailored to suit pipewall thicknesses of 1 to 1.5 mm when combined with the 1 mm “U” shaped sealin. Wall thicknesses of 1.5 to 2 mm are covered by the 2 mm “U” shaped seal. This not only guarantees a consistently high connection strength and freedom from leaks in the pipeline, it also ensures the greatest possible ease of installation. Your assembly times will immediately shorten with the new QUICK CONNECT® pullring. 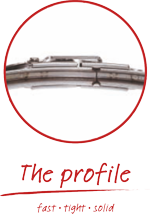 The wide open profile noticeably simplifies attachment to the “U”-shaped seal fitted to the lipped pipe ends. 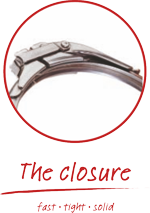 The pull-ring bolt is pre-set at the factory to positively engage with the pipe ends ensuring fast toggle-clip closure. If necessary, the adjustment bolt can be screwed further after fitting, in order to increase the connection strength & pressure tightness. Reduce the size of your stocks on a sustained basis with the new QUICK CONNECT® pullring as it combines the advantages and functions of existing types of pull-rings. Its stability and sealing properties are on a par with those of a two-part pull-ring. Because the new pull-ring can be easily readjusted, it can be fitted more quickly than the previous quick-release ring. The pull-ring for all occasions! You keep fewer parts in stock but are still can react speedily. 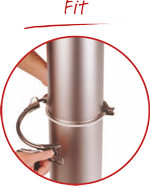 Reduce the amount of planning with the universal QUICK CONNECT® pull-ring. No more need to choose between a quick fit or leak-free and stable solution. With the new pull-ring, all pipe parts are in place in the blink of an eye – with the excellent sealing properties and strength that you would expect from Jacob of course. Dismantling is just as slick, adding to its versatility. Click – and the QUICK CONNECT® pull-ring is in place. The solid and ergonomically shaped grip enables the toggle clip to be opened and closed firmly and without the risk of injury. Time and time again. Thanks to the overlaps on the ends of the ring and combined with the new design “U”shaped seal, the new QUICK CONNECT® ring provides the greatest possible freedom from leaks. 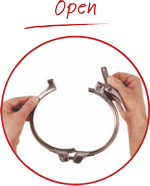 The strength of the new QUICK CONNECT® pullring has been certified by the independent specialist institute DMT. When tightened with 10 Nm, it has an explosion pressure resistance of 3 bar.